We had a deluxe site. Concrete pad that was level and pull through. Someone had not picked up after their dog & we tracked it into our RV. The gnats were merciless so we couldn't sit outside. The park was gorgeous, however, with nice wide roads. We camped at Eagle's Roost RV Resort in a Motorhome. The sites are grass and very narrow. With our slides out it was 33" to the slide of the next lot occupant. No picnic tables or fire rings. One of the best signed entrances that I have seen. The site was level. didn't need to put the jacks down to level the coach. We had an electrical problem but it was fixed the next day and we were able to plug into an adjacent empty site for our first night. We will return. We camped at L&D RV Park in a Motorhome. There are only 6 pull-through sites. Our site (27) was a tough entry & exit but it was absolutely level. Verizon 4G was 3 out of 5. Over the air TV was basically nonexistent but cable was provided. Did NOT do garbage pickup at your site. We camped at Chattanooga North / Cleveland KOA in a Motorhome. After climbing the approximate 400 ft high goat hill to get to the actual campground, everything was relatively level. Our site was level. Verizon 4G was 3 out 5 bars. Over the air TV was sparse but free cable was provided. Of course you had to descend the goat hill when leaving. We camped at Renfro Valley KOA in a Motorhome. Campground has a limited number of pull through sites. We had an excellent, level back in site with lots of room. The only negative to this location was that the GPS location is .2 mile farther down the road and the Sign for the campground is relatively small. We will stay here again. They sent us a thank you email after our stay. Nice touch. We camped at Lebanon / Cincinnati NE KOA in a Motorhome. Available sites were back in only. They were soft grass where the motorhome left impressions in the grass. You were allowed to pick your own site. We toured in the car to select our site. Roads are narrow but big rig accessible. A nice friendly park. We camped at Stage Stop Campground in a Motorhome. Winter Garden village shopping. Exceptional outdoor mall. This park is NOT big rig friendly. We were placed into a lot that was covered in black dirt. it was supposed to be a pull through but we couldn't get our toad to fit in the lot. the sewer connection was uphill. the water connection was just a little over a foot above ground so it was impossible to connect any hose with a pressure regulator. When leaving we were unable to drive forward due to cars parked along the narrow road and had to back out of the lot. We barely managed to negotiate the tight turns to get out of the park. JFYI the dirt tracked into the coach. 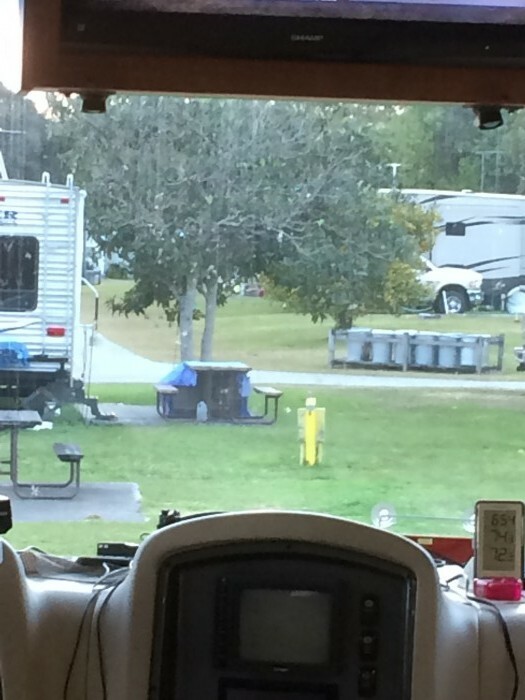 We camped at Orlando Winter Garden Campground Resort in a Motorhome. We wintered here from nov 14 to april 15. Lots of activities i.e. dances, entertainers, shuffleboard, minigolf etc. 2 pools. 1 outdoor and one indoor. Nice restaurant by the outdoor pool. Open 7am to 3pm 6 days. Lots of activities. We will return next winter. We camped at Holiday RV Village in a Motorhome. The roads in are a little tight for a big rig, but passable. Wifi signal was great but slow. Only .8 mbps down & .85 mbps up. Adequate for email. Sites were crushed gravel and very level. On the whole a nice park We camped at Indianapolis KOA in a Motorhome. There are very few level sites in this park; you need lots of leveling blocks. There are some 50amp sites available. Can be navigated with a big rig with caution. Bery wooded & hilly campground. Probably would return. Verizon 4g was 5mbps down .6mbps up. We camped at Bewabic State Park in a Motorhome. We stayed here during state fair week. We were in an area of the campground that only had electric & cable. We couldn't get the cable to work. Sites were grassy with some soft spots. Navigating the roads with a large rv was challenging but doable. We would definitely stay here again We camped at Gladstone Bay Campground in a Motorhome. We camped here with a FMCA rally. Sites were level, but grassy. Was quite a ways from the camping area to the actual fairgrounds. Sewer dump was not accessible by a large motorhome. Thirty amp only was a pain when the weather was warm. We camped at Delaware County Fairgrounds in a Motorhome. As the last review mentioned, this is a relatively new park. The GPS location of the street address was wrong. You need to go about 300 yards farther up the road. We arrived late (after the office was closed) and the manager came over to help us back into our site. Very nice park with full hookups. We will stay here again. We camped at Deer Run Resort in a Motorhome. The prior comment about 50% of the sites being seasonal were correct. The park has a tremendous amount of activities for kids, rentals of bikes, etc. All of the golf carts were rented when we were there, but the manager let us use her golf cart so that we could get a good look at the campground. She was extremely helpful. There were plenty of lots open (Saturday night). Some of the newer sites for the larger rigs were level challenged. We will stop here again. 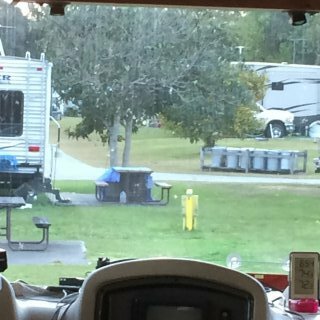 We camped at Rivers Edge Campground in a Motorhome. We have stayed here many times and just love this park. Although the big rig section is not near the water, the sites are gravel and fairly level. My Verizon 4G aircard attained download speeds of 30mbps and upload speeds to 15mbps. The rate was higher due to the reservation surcharge of $8. We camped at Straits State Park in a Motorhome.